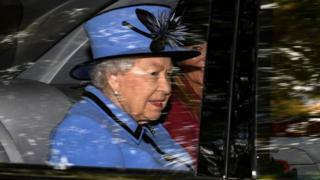 The Queen has been joined by Prime Minister Theresa May for a church service at Crathie Kirk near the Balmoral estate. A car carrying Mrs May and her husband Philip was seen taking them to the 11:30 service. Charles and Camilla, known as the Duke and Duchess of Rothesay when in Scotland, also attended. The Queen and the Duke of Edinburgh are nearing the end of their annual summer break at Balmoral.